Paul (Chyi-Shyang) Lin is from Taiwan with a family rich in the tradition of Chinese medicine. His father specializes in a very unique diagnostic skill, on-the-back-examination, and utilizes topical herbal treatment. 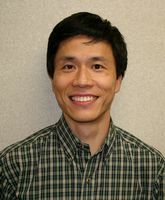 After receiving a Masters degree in Environmental Engineering at Marquette University his studies included acupuncture and Chinese herbal medicine at Northwestern University of Health Sciences in Minnesota for a second Masters degree. Returning to Taiwan, he studied Chinese medicine under his father's supervision for 2 1/2 years. Paul has been practicing in the Eau Claire area since 2001. He enjoys playing ping-pong, card-games, and outdoor activities like hiking, canoeing, camping with Maria and his daughter Alana.